Previous Prev The #LabtestContest Is Back- Can You Guess My CD4 Count? Every day is a Day. Which isn’t a bad thing- topics need addressin’ and there’s surely more than 365 things that we could all learn more about. Today just so happens to be International Kissing Day. 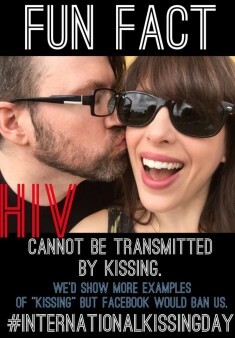 Gwenn and I decided to take some cutesie pics of us pecking each other on the cheek... then I thought: some people still think HIV can transmitted through french kissing. So I went into a photo editing app and turned a fun moment into a Public Service Announcement, posting it on Facebook and asking for some shares. Now, with my work done, I still have a good portion of the day to get to some of those other safe ways of kissing Gwenn. Hope you are enjoying Kissing Day as well!